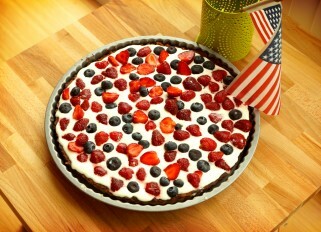 Great idea for the Fourth of July or a summer dinner. 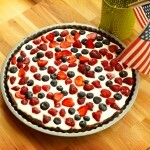 Instead of whipped cream you can use sour cream, just mix 1 cup sour cream with 4 tbsp of sugar, adding a little vanilla. But this cream can be is slightly runny for the next day. Add the flour, nuts, sugar, salt, almond extract and butter in a food processor, beat for a few seconds until the butter is the size of a pea. Add ice water and beat again. Put the dough in plastic wrap, form into a disk, close tightly and place in refrigerator for 40 minutes or in the freezer for 10-15 minutes. Roll out the dough on a floured cutting board. I usually cover the dough with plastic wrap on top so the dough will not stick to the rolling pin. Spray tart pan (~10 inches) and put the dough on top, pressing and smoothing with your fingers across the surface of the pan. Put in a freezer for another 5-10 min. Preheat the oven to 200'C and cook the dough for 20-25 minutes on the bottom shelf. Reduce the oven to 160'C. Whisk the eggs, yolks, sugar, salt, lemon juice and zest in large saucepan with a heavy bottom, add the butter and cook over low heat, stirring all the time for about 10 min. Don’t let the filling boil! Let cool a little bit and strain through a fine mesh over the crust. Put the lemon tart in the oven for another 10 minutes. Let cool again. Whisk the whipping cream with the sugar and spread on top of the lemon tart. Decorate with berries before serving.